- Auto-exchange to BTC only for payout. - 0.003BTC minimum threshold for 48 hours payment. BitToken's BXT have a new Development Team and BitToken's Development aims to continue. We think that the coin has a big potential and is worth to continue. We also want to create a worthwhile project - BXT will be a long term project. The BitToken Team is striving to develop a strong community with a secure and reliable usability of BitToken's. We are looking for the community to direct the development. Get involved and contribute: We aim to give everyone an equal say in the direction. coin we do need the communities support. You can be part of this community. Start to mine BitToken's and spread the word. If you have further ideas that could help and support the coin, do not hesitate to post your ideas to this new thread. The BitToken Team would like to welcome you! Please give the new twitter account a follow to stay up to date (@Bittokens). A new website is being built and will be unveiled shortly. Good news for BitToken's investor's! BitToken's further Development is set to continue. 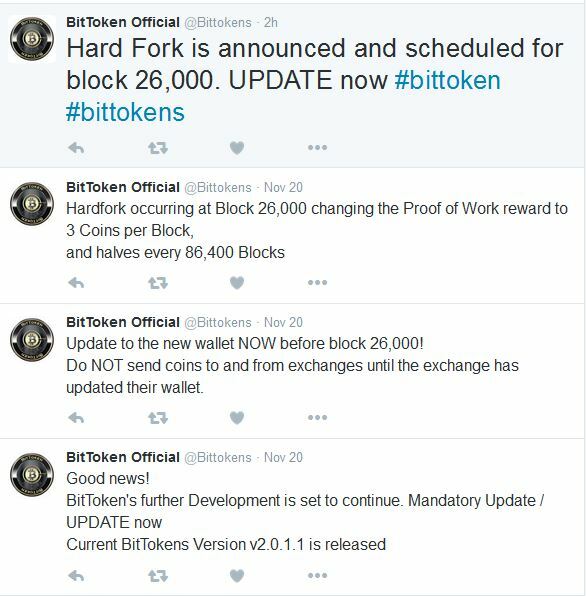 Re: [ANN] BitTokens - BXT - MANDATORY update (v2.0) before Block 26000 - update now! Please backing up your BitTokens wallet.dat before updating. UPDATE BitTokens Version v2.0.1.1 before block 26,000! for infos, updates, news and more..
Current BitTokens Version v2.0.1.1 is released. Update to the new wallet NOW before block 26,000! Do NOT send coins to and from exchanges until the exchange has updated their wallet. or Bit Tokens have a new Dev and team work? exept Yobit.net. They should update soon. Currently the BXT Deposit on Yobit.net is temporary off. A new thread its part of moving forward. Best of luck!! I'm on board. I really like the colors in the ann graphic. Great job. can you please re-activate the BXT suprnova pool? Any information about future plans? and the current BitTokens MAC Walllet Version v2.0.1.1.